In the last chapter, we extended our Edit Hike view by adding a second view to select which hike we're going to edit. This was a big step forward, but now it's about time we start splitting up our code into smaller, reusable components so that our code will be easier to manage as our project grows. This will teach us how to utilize important tools that Fuse provides for managing the complexity of real-world app projects. More specifically, what we'll do in this chapter is separate out our two views - the hike selector view, which will become our home page, and the edit hike view, which will become our edit hike page. Now, because this is a lot of ground to cover, this part of the tutorial will only go over how to split our view into separate components, not how we'll fit them back together and develop the flow of our app. At first glance, it looks like we're just creating a Page with a funny ux:Class property and nothing in it. But what's a Page exactly? And what's with this ux:Class stuff? To answer the first question, a Page is basically a special kind of UI element that will participate in navigation. We don't actually have to use a Page here; we could just as well use a Panel, a Button, or something else entirely. But it's generally considered best practice to use a Page if you're going to use the component with navigation specifically, which we'll do a bit later in this chapter and the following one. As for the second question, ux:Class means that instead of creating an instance of a Page, we're creating a class that extends the Page class. If you've ever done some object-oriented programming before, this terminology will sound very familiar. If not, it may sound a little strange, but it's actually a pretty simple concept to grasp. Basically, we can think of a class as a kind of element, and an instance is an element of that kind. For example, Button is a class, and when we say <Button /> in UX, we're making an instance of the Button class. Button describes how a button element should look and feel, and <Button /> describes that an actual Button element exists in our view. But what does extend mean in this context? It simply means that we're going to make our own class that is basically the same as a given class, but we'll add a few things of our own. In our case, we still want to end up with a Page, but we want some extra stuff on it as well (the stuff that's specific to our view). So, we'll say <Page ux:Class="EditHikePage" />, which means we're going to create our own class called EditHikePage that extends the Page class. Then, whenever we want to use this class (create an instance), instead of saying <Page /> and putting all of our custom stuff inside it, we can simply say <EditHikePage />. You can find out more about classes in our Creating Components documentation. Notice how this looks just like we had used any other class that comes standard in Fuse - but this time, it's a class we've created ourselves! If we save MainView.ux, we'll see that our view shows up again in preview. Awesome! 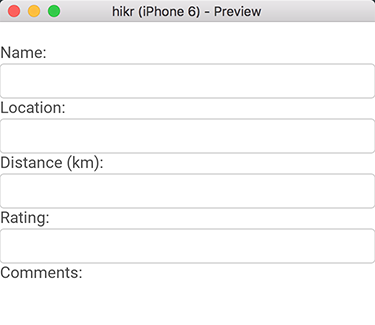 At this point, our EditHikePage class is actually two components in one - a hike selector, and a hike editor. Generally, when making components, it's a good idea to make sure they're a simple as possible, and that they only represent one thing, like a single view. What we'll do next is to separate the selector view into its own class, which we'll call the HomePage. And that's it! At this point, our page should be ready for display. By now, we've got multiple pages, and we'll need a way to display them and navigate between them. In Fuse, this is handled by the Navigator component. Navigation in general will need a proper introduction, and we'll want to take our time learning how to do it properly, so we'll take a closer look at it in the next chapter. For now, to keep things simple, we'll use a PageControl instead. A PageControl is great for cases where we want to have a few pages side-by-side that we'll to swipe between, which is just fine for initially displaying our two pages. And now, when we save all of this, our new HomePage will be displayed, and we can swipe right to reveal the EditHikePage as well. 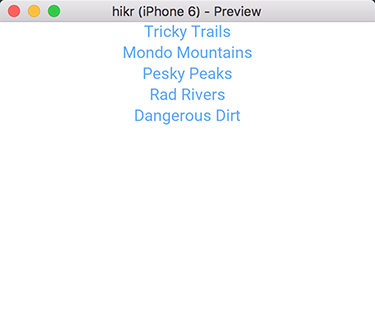 Selecting hikes also works exactly as it did before. Cool! Now that we've got our two views separated into different components, it is time to take a closer look at how we do navigation in Fuse. In the next chapter we'll start creating a propert flow through our app, and learn how we can create separate models per page to make our app even more structured. So when you're ready, let's move on!